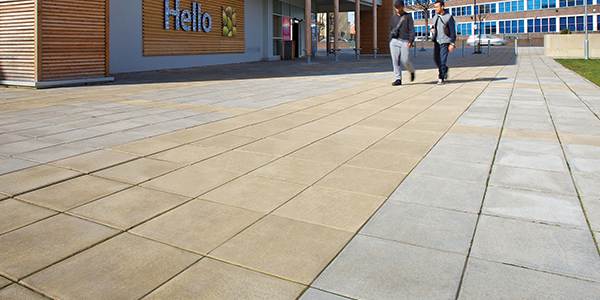 Durable and functional, Coloured Pimpled Paving from Marshalls manufactured using 80% recycled content and is ideal for any urban landscaping project. 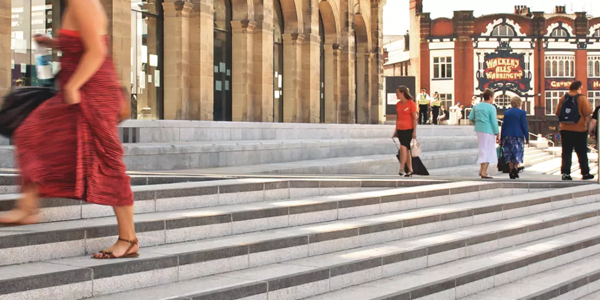 Its highly textured pimpled surface maximises traction for skid performance, making it ideal for busy public spaces, such as transport hubs, pedestrianised zones and shopping areas. In a choice of 2 thicknesses, 4 colours Natural, Buff, Charcoal and Red and a number of sizes ranging from 300×300 all the way up to 900x600mm to provide an attractive when used together to delineate distinct areas or individually for a uniform aesthetic. Marshalls Saxon Textured Flag Paving provide a unique textured finish surface through its blend of a hard Yorkstone aggregate delivering both durability and non-slip properties. Available in 3 colours Natural, Buff and Charcoal, an extensive range of thicknesses and sizes available, Marshalls’ Saxon Textured Flag Paving is suitable for any landscape application. A comprehensive choice of plan sizes is offered including Step Tread formats. Other products in the Saxon range include Saxon Bollard Surround Units and Saxon Kerb, allowing designers to create a uniform finish. Trafica formats and the optional use of patented Fibre Reinforcement also means that Saxon paving can be deployed in areas of variable loading requirements. Blended with a hard Yorkstone aggregate, Marshalls Perfecta Smooth Ground Flag Paving combines fantastic aesthetics and outstanding technical performance to act as a cost-effective alternative to premium natural Yorkstone. The paving provides the warm, rich colour and character of natural Yorkstone, as well as durability and both wet and dry non-slip qualities at an affordable price. Additionally, Perfecta is extremely versatile and is available in 2 colours Natural and Buff, a comprehensive range of thicknesses and plan sizes, from 400 x 400m to 600 x 600mm. It is also available with chamfered edges, which reduce the risk of spalling. Marshalls’ Perfecta range comes in Trafica formats and versions of the product that feature Fibre Reinforcement for increased toughness and resistance to impact and overloading, which means it is suitable for the majority of variable loading applications. Tegula Cobbles weathered concrete setts provide an attractive, natural-looking surface, ideal for busy pedestrian areas and suitable for use in pedestrian applications for civil, retail, commercial and residential schemes, used either on their own or to add attractive detailing to standard Tegula surfaces. Tegula Cobbles are available in 3 colours Traditional, Pennant Grey and Harvest and can be installed in a mix of colours to create a truly bespoke effect or add detailing to walkways. 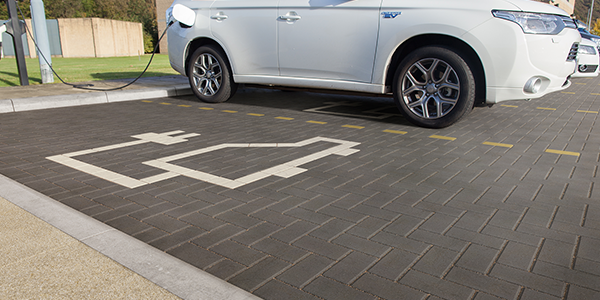 Keyblok Marker Blocks are available size 100 x 200mm blocks, 2 thicknesses 60 and 80mm they are slip resistant, durable range of colours, perfect for delineation between parking bays and road lanes, disabled parking, loading bays, electric car recharge points as well as for permanent signage for highways and high traffic volume areas.. 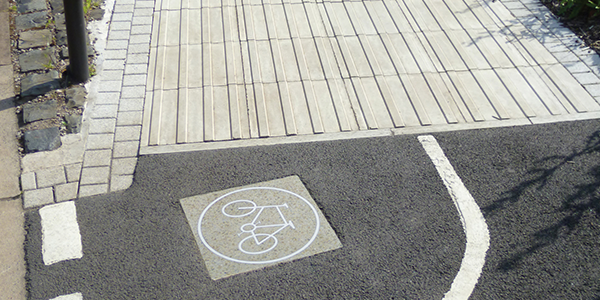 Specially designed, these clear markings remove the need for overpainting and can effectively highlight specific areas, particularly Black and yellow or black and white blocks are often interspersed for effect such as at crossings. 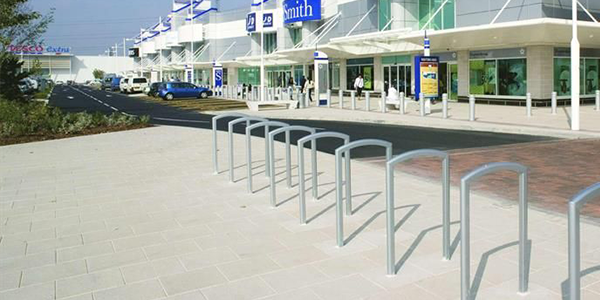 A striking, contemporary surface option which offers excellent drainage without the need for drainage channels, Marshalls’ market-leading Priora system has been proven over 15 years of successfully installed projects. The patented nib on the edge of the Priora blocks creates voids through which water falls into a specially prepared sub-base. The nibs interlock to enhance surface stability, with tests showing they provide 40% more interlock than our standard block. The result is maximum structural integrity as well as unsurpassed SuDS performance. Provided the sub-base is installed to Marshalls’ specification, Mistral Priora is suitable for all loading requirements. 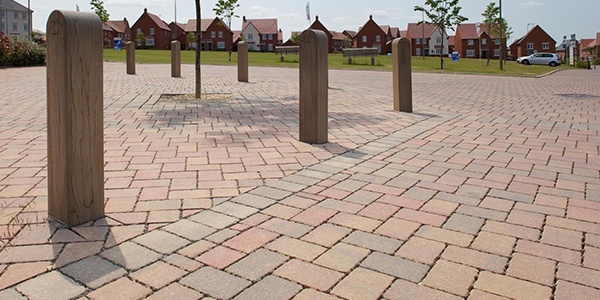 It means that specifying Marshalls Priora blocks will bring long-term benefits in relation to pavement longevity and maintenance requirements. 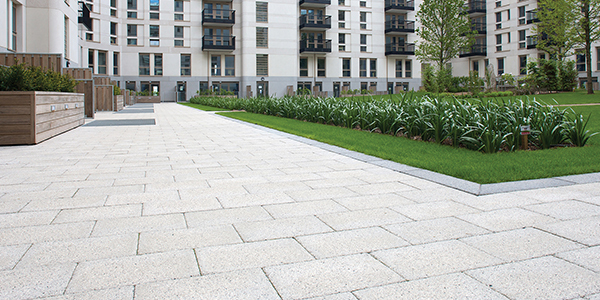 Available in 3 different colours of Charcoal, Harvest Buff and Silver Grey, the exposed granite aggregates in the textured surface make Mistral Priora the first choice SuDS solution for modern developments and contemporary public spaces. Random Course or Herringbone patterns are achievable, and must be stated at the time of order. Marshalls Cycleway Tactile Flag Paving is used to provide a visual and physical indication on the beginning or end of shared pedestrian/cycle routes which are not separated by different levels and a visual and detectable underfoot warning to pedestrians including the visually impaired, to the proximity of a cycleway. It is also used as a central delineation strip running the length of the shared route to provide a false kerb for visually impaired pedestrians. The Charnwood Textured Flag Paving range incorporates both modernity and durability in its design. The use of larger-size aggregates adds definition to its surface texture finish, allowing for the creation of a unique paving scheme. 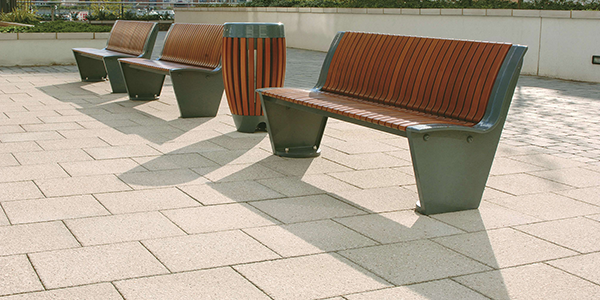 This manufacturing process delivers a contemporary look to urban environments, without compromising on strength or durability, making it the perfect choice for pedestrian-heavy areas. 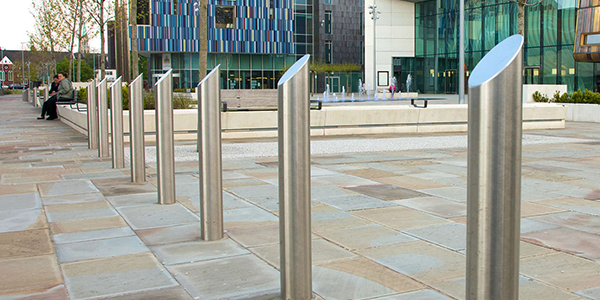 A more economical alternative to Conservation paving without sacrificing style or quality, its subtle colour palette of Buff and French Grey allows installations to blend well with a range of modern environments. Charnwood Kerb is also available to enhance final projects by ensuring consistent colourways. 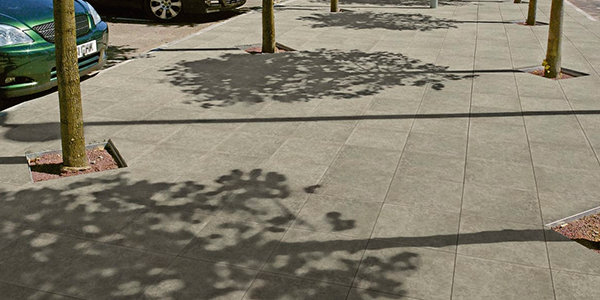 First introduced to bring urban developments to life, Conservation paving offers a charming contemporary style known for its unique blend and lavish mix of natural granite aggregates and is further enhanced by a choice of surface finish. The new enhanced Conservation range is now available in three finishes and three colours. The new skimmed surface finish gently exposes the aggregates providing an enhanced colour finish on the surface as it draws out the unique blend and lavish mix of aggregates. The new colour Heather Grey is bursting with colour and complements the existing Silver Grey and Charcoal Grey colour palette, giving clients the ability to mix and match for greater creativity. 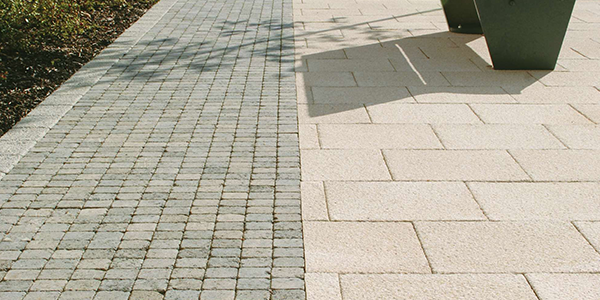 Urbex paving provides a cost effective utility paving solution that’s suitable for commercial pedestrianised areas and housebuilder pathways and patios. 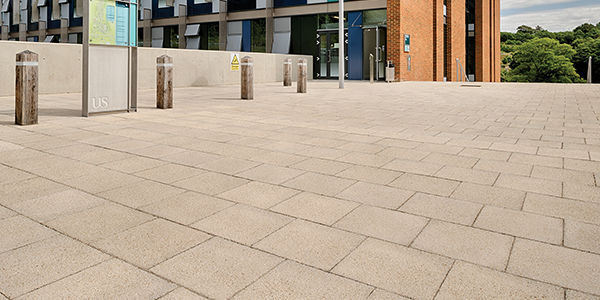 Urbex is now available in two finishes, 3 modular sizes, a choice of thicknesses providing a paving solution that’s suitable for hard standing utility areas to provide a cost effective solution for multiple spaces. 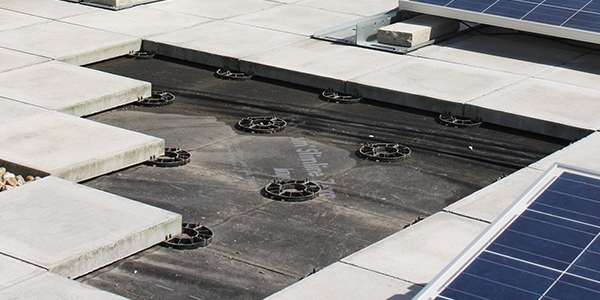 A range of products used to create level flooring systems on balconies and roof decks and allow pavings to be suspended and allow water to run away to prevent ponding and a build-up of dirt and debris between slabs . Integral spacers create a joint between paving units and the height can be easily adjusted using the threaded core. The product is available flat in 12 to 25mm that can be stackable and adjustable up to 600mm height. All the supports have lugs to ensure a secure seating fixing for the paving or with various profiles to accommodate decking. Accessories include shims to counteract undulations in the roof surface and any minor variations in the slab thickness and adjusting key. Marshalls’ natural stone steps are DDA-compliant, easy to install and require little maintenance. Our step offering is available across our most popular paving ranges, including Conservation, Perfecta and Saxon, in a selection of sizes, Marshalls can advise on the efficient and timely installation of natural stone and concrete block paving steps.